I was totally blown away by the response to the FREEBIE linky party!! I really didn't expect many people to care or to link up, but I guess I underestimated the allure of something free! Thank you to all who participated. There are lots of really great resources. Here's one more activity you can download for FREE as a way to say "thanks!" 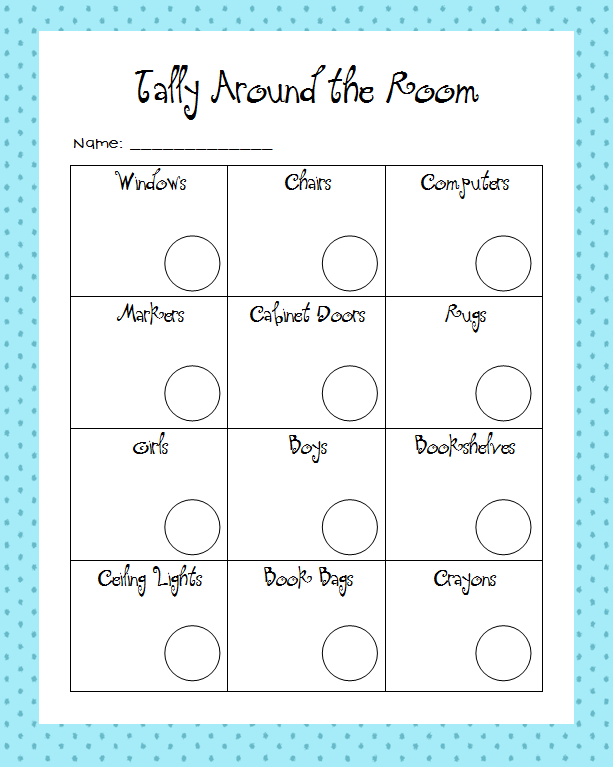 Directions: Students will walk around the room and tally each object listed. Then, they can record the number in the circle. I tried to keep in generic so it can be used in many types of classrooms. The "crayons" and "markers" are meant to be the amount at the child's own desk-- unless you have a quick finisher that you need to keep extra busy ! For some reason I am having trouble downloading this. Looks cute!! I can't download it either! Bummer! I'm sorry the link isn't working. I'm out of town without my computer. When I get home next week I'll give it another try. Try the link again. It should work now.